Looking for an easy “twist” on a quick snack? Tired of plain old pretzels and boring snack mix? Give these Garlic-Parmesan Pretzels a try! 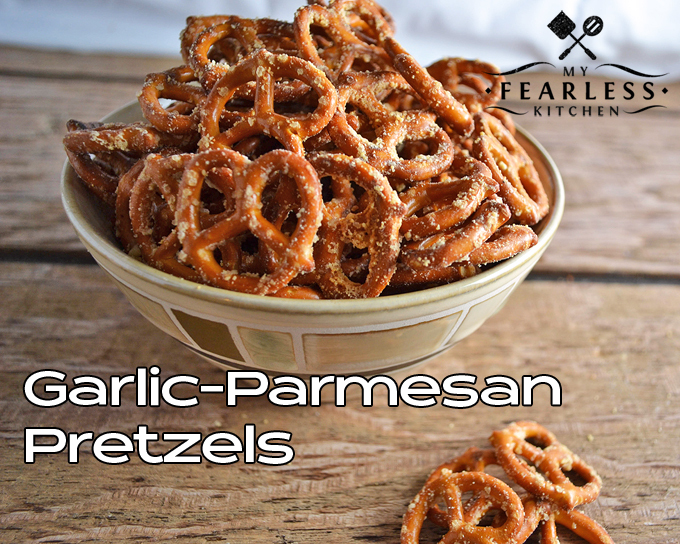 Then I found this recipe for Garlic-Parmesan Pretzels in “Mom Knows Best” by Gooseberry Patch. (I’m loving every recipe I’ve made so far. Seems like Mom really does know best! Garlic-Parmesan Pretzels it is! Four ingredients. Six minutes. Seriously. You’ll want a bigger bowl than you think you need. You need enough room to fit all the pretzels, with extra space for the mixing and tossing you’ll need to do to get the pretzels coated with the butter and seasonings. This 4-quart bowl should do the trick. If you like these Garlic-Parmesan Pretzels, I know you’ll also love these Easy Ranch Pretzels! Don’t forget about these delicious pretzels after you put them away! Grab your free printable pantry inventory sheet and always know what snacks are hiding in the back of your cupboards. Want even more recipes? Check out my Quick & Easy Snacks board on Pinterest! Need a fast snack that's easy to make and that tastes good? 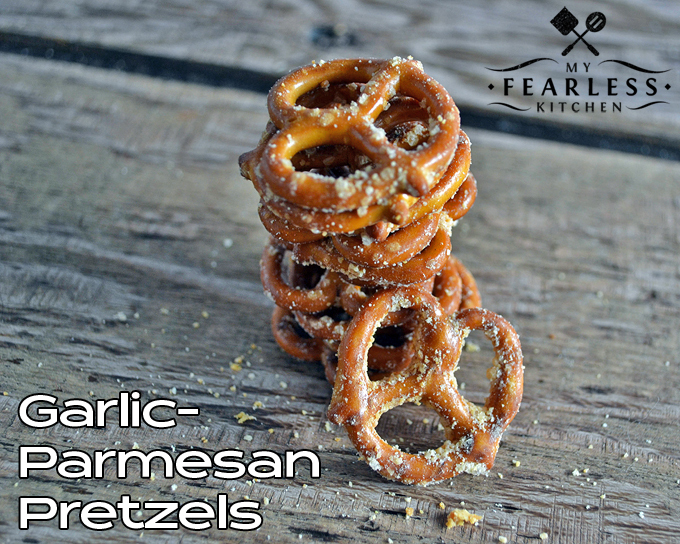 Try this recipe for Garlic-Parmesan Pretzels. Only 4 ingredients and 6 minutes to snack time! Place pretzels in a large microwave-safe bowl; set aside. Combine butter and garlic powder in a one-cup glass measure. Microwave, uncovered, on high for 30-45 seconds, until butter is melted. Stir to combine. Drizzle butter mixture over pretzels; mix lightly. Sprinkle with cheese, mix again. Place pretzels in the microwave. Microwave on high, uncovered, for 3-4 minutes. Stir 1-2 times during cooking. Cool.